What to do when your watering can is too small? Some of my herbs and flowers are located more than 200 feet from the water source and cover a 300 square foot area. A 2 gallon watering can just doesn’t work. I know, I tried. That’s why I now use a 30 gallon barrel to carry the water. The barrel is attached to a 600-lb rated hand truck, and a Terapump barrel siphon pump transfers the water to the watering can or from the other rain barrels. 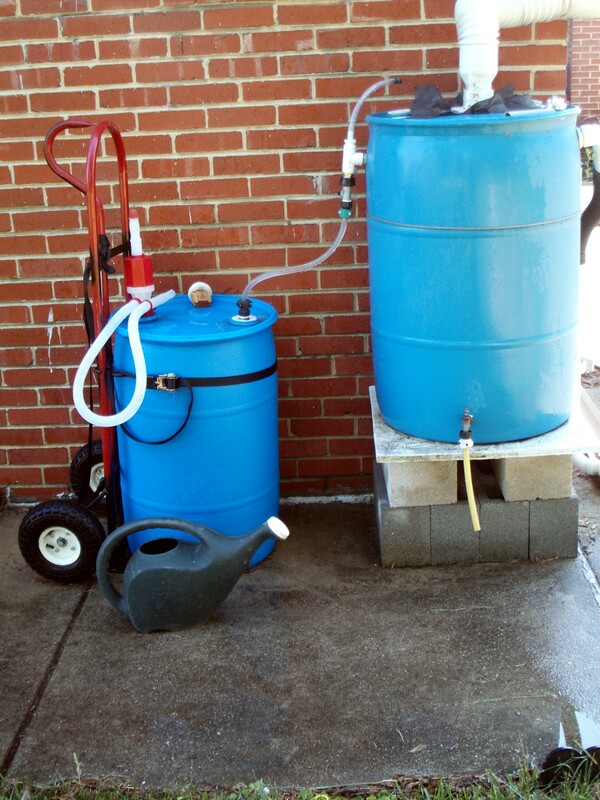 As seen on the picture, the 30 gallon barrel watering can is used as a rain barrel too. Is it heavy? Yes and no. The barrel full of water weight 255 lbs. I feel the weight only when I tip the barrel from the vertical point to a position where the barrel is balanced on the hand truck wheels and vice versa. I found it’s easier to pull than to push the hand truck. Still, for something lighter, you can use a 15 gallon barrel that weighs 132 lbs when full. This is so clever, Nicholas! I can tell what a difference rain water makes vs the chlorinated town water that comes out of the hose. Hose water keeps things alive, but rain water helps them thrive and grow. I have ten rain barrels and haul the water to various spots (greenhouse, veg/herb/flower garden, birdbaths, kitchen pots) in 5-gallon buckets. I figure it's good for muscle tone, but not great on the back. Good solution. Holy cow, what a great idea! We've been thinking about getting a battery/solor powered pump to use with a garden hose, but your manual siphon to a smaller barrel, which can be wheeled where ever is genious! Where did you buy the stuff to make this?